The TTP Model provides a YANG-modeled type for a TTP and allows them to be associated with a master list of known TTPs, as well as active and supported TTPs with nodes in the MD-SAL inventory model. The key API provided by the TTP Model feature is the ability to store a set of TTPs in the MD-SAL as well as associate zero or one active TTPs and zero or more supported TTPs along with a given node in the MD-SAL inventory model. 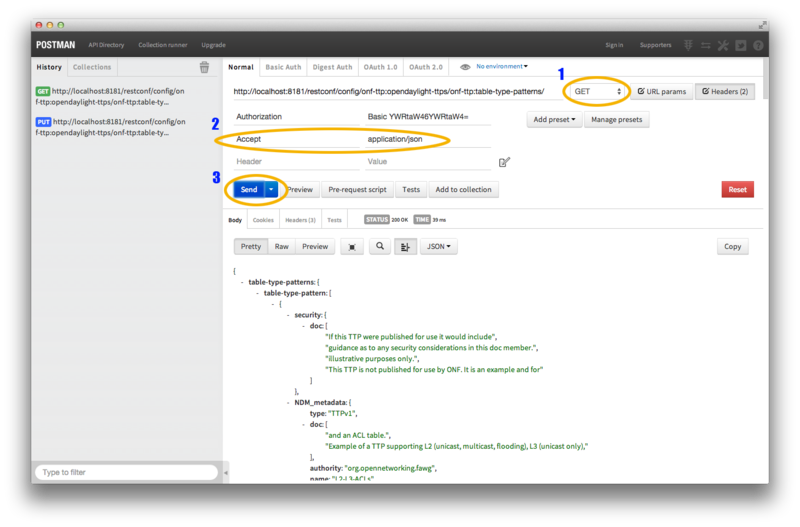 Look for the onf-ttp module to expand and see the various RESTCONF APIs. 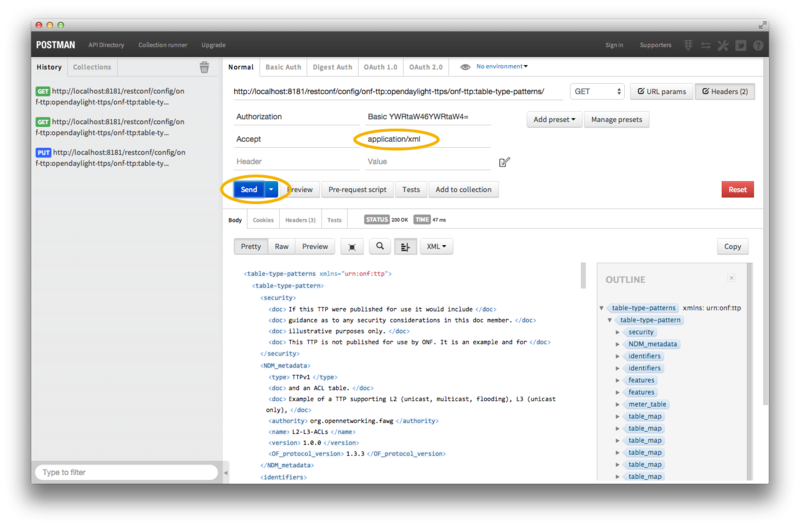 The REST API calls require authentication by default. The default method is to use basic auth with a user name and password of ‘admin’. RESTCONF supports both xml and json. This example focuses on JSON, but xml can be used just as easily. When doing a PUT or POST be sure to specify the appropriate Conetnt-Type header: either application/json or application/xml. When doing a GET be sure to specify the appropriate Accept header: again, either application/json or application/xml. 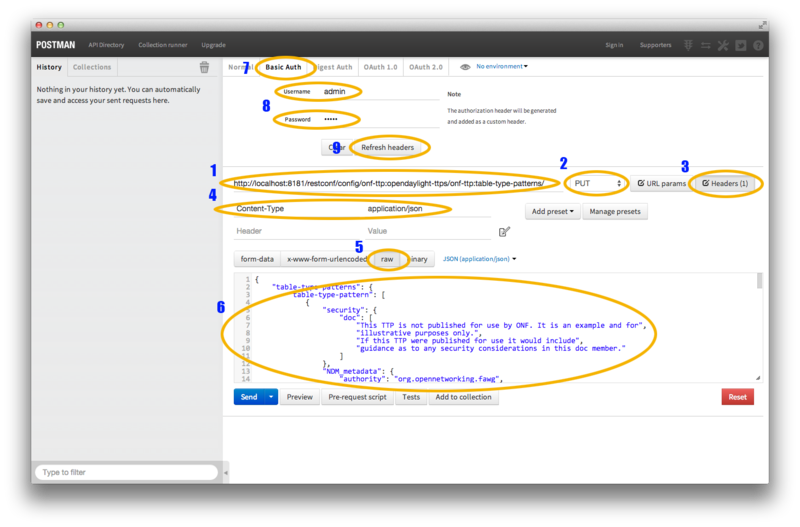 The contents of a PUT or POST should be a OpenDaylight Table Type Pattern. An example of one is provided below. The example can also be found at parser/sample-TTP-from-tests.ttp in the TTP git repository. Sample Table Type Pattern (json). "guidance as to any security considerations in this doc member." "The VLAN ID of a locally attached L2 subnet on a Router." "of the type indicated by the variable name"
"Flow entry notification Extension – notification of changes in flow entries"
"Group notifications Extension – notification of changes in group or meter entries"
"Directs all other packets to the Ingress VLAN table." "Mandatory filtering of control frames with C-VLAN Bridge reserved DA." "Mandatory miss flow_mod, sends packets to IngressVLAN table." "Entry per port, plus entry per untagged VID per port." "required (whichever is more concise or more useful." In this example we’ll do a PUT to install the sample TTP from above into OpenDaylight and then retrieve it both as json and as xml. We’ll use the Postman - REST Client for Chrome in the examples, but any method of accessing REST should work. After clicking Refresh headers, we can see that a new header (Authorization) has been created and this will allow us to authenticate to make the REST call. At this point, clicking send should result in a Status response of 200 OK indicating we’ve successfully PUT the TTP into OpenDaylight. 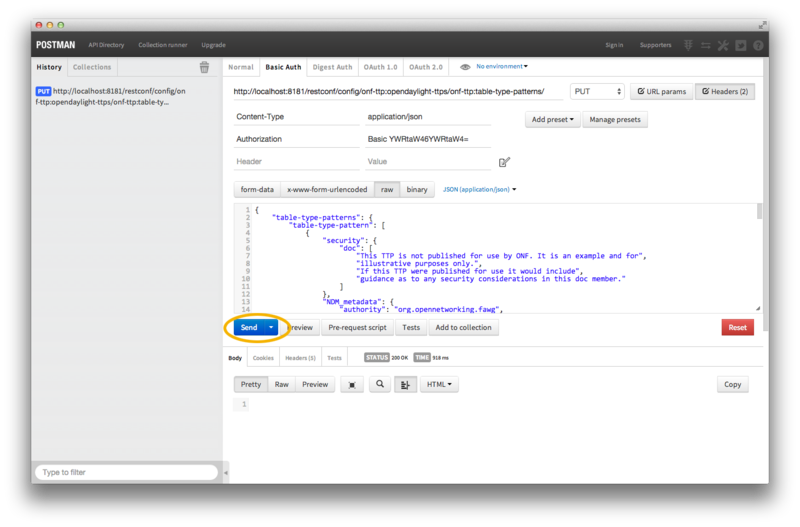 The same process can retrieve the content as xml by setting the Accept header to application/xml.